"Office staff were always nice. Always expected to be seen at appointment time." "Coming to GLFA was one of the best decisions I have made!" "My experience at this facility is fantastic." "Amazing doctors! The staff is friendly and helpful." "They staff is so friendly and very helpful. Sending my whole family to see them." "Amazing docs! Quick, professional and knowledgable." Great Lakes Foot and Ankle Institute PC offers routine and surgical foot and ankle care for all age ranges. With six locations in Chesterfield, Clinton Township, Fort Gratiot, East China Township, Shelby Township, and Rochester, Michigan, it’s one of the largest practices in the area, making it easy to find an accessible clinic. Having many locations and physicians, Great Lakes Foot and Ankle Institute PC makes it convenient and easy to get an appointment. Each location has digital X-rays and over-the-counter lotions, creams, and ointments in-office, allowing every patient to comfortably leave their office after each visit. The team offers a wide variety of services from diabetic care to sports injuries. They believe it’s important to educate their patients on all possible treatment options. The expert podiatrists and staff believe in the importance of the doctor-patient relationship. It takes the doctor and patient as a team to receive optimal foot and ankle treatment. The physician listens closely to the patient’s concerns and educates the patient on possible treatment options; working together can give the patient the customized treatment they need. The Great Lakes team is dedicated to following up to make sure the patient's pain is relieved and health is improved. The Great Lakes website includes a section covering a full array of topics associated with podiatry and podiatric diagnoses and treatments, giving people a chance to stay informed about podiatric problems and treatments. The website also includes paperwork that patients can print out and complete prior to visiting the office, requiring less to deal with at the office. 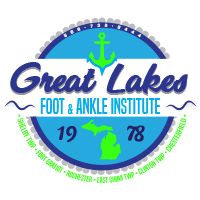 Call the office or schedule an appointment online today to see how Great Lakes Foot and Ankle Institute PC can help your ankle and foot concerns. At Great Lakes Foot and Ankle Institute, we care about every patient. Here are some of the plans that we take. Please call our office if you have any questions about your payment plan, or the insurances we accept! "They are friendly, courteous, and the staff is very friendly. I would recommend this practice to all my friends!" "My initial surgery was done with excellence and I continue to recover and conduct my daily life better than I expected. I would recommend Great Lakes to anyone." "I was seen on time and the staff was exceptionally professional and friendly. The follow-up visit was quick and pleasant as well." "He was great to talk to and explained the procedure to repair my foot. He did a wonderful job. Pain free. Starting to run again." "I was amazed by how quickly he preformed the procedure and how his team all worked together to provide top notch. I would recommend him to any of my loved ones. "